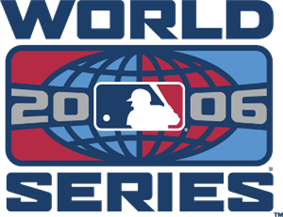 The 2006 World Series, the 102nd edition of Major League Baseball's championship series, began on October 21 and ended on October 27, and matched the American League champion Detroit Tigers against the National League champion St. Louis Cardinals. The Cardinals won the Series in five games, taking Games 1, 3, 4 and 5. This was the third Series meeting between the Tigers and the Cardinals, the first in 38 years. St. Louis won the first in 1934, and Detroit won the second in 1968; each went the full seven games. The 1968 Series was the last before divisional play and an extra round of playoffs began. The Cardinals, who moved into Busch Stadium in April, became the fourth team to win the Series in their home stadium's debut season, joining the 1909 Pittsburgh Pirates (Forbes Field), 1912 Boston Red Sox (Fenway Park) and 1923 New York Yankees (Yankee Stadium (I)). In 2009, they would be joined by the 2009 New York Yankees (Yankee Stadium). St. Louis also won their 10th Fall Classic, the most of any National League franchise, and second to only the Yankees' 27 (then 26) titles, and their first since 1982. Cardinals manager Tony La Russa, who won the 1989 World Series title with the Athletics, became the second manager in history to lead teams in both leagues to championships, joining Sparky Anderson. Tigers manager Jim Leyland, who won the 1997 World Series title with the Marlins, also could have became the second manager in history to lead teams in both leagues to championships, had the Tigers won the series. Two rookies faced off in Game 1 for the first time in history: Anthony Reyes for St. Louis and Justin Verlander for Detroit. It looked like the Tigers were going to get to Reyes early in the bottom of the first, when Craig Monroe doubled and Magglio Ordóñez walked. Carlos Guillén singled Monroe in, giving the Tigers a 1–0 lead. However in the top of the second, Scott Rolen hit a long home run to left field, tying the score at 1–1. Rolen was 0-for-15 in his career in the World Series before hitting the home run. The previous mark had been 0-for-13, set by Benny Kauff of the New York Giants in the 1917 World Series. In the third inning the Cards broke through, first when Chris Duncan's RBI double scored Yadier Molina to give the Cardinals the lead. On Verlander's next pitch, 2005 National League MVP Albert Pujols banged a two-run home run, punishing the rookie who elected to pitch to the dangerous Pujols, rather than walk him with first base open and two outs and pitch to Jim Edmonds. Meanwhile, Anthony Reyes was the story. The pitcher who had the fewest regular season wins of a Game 1 World Series starter (5) at one point retired seventeen in a row from the first inning to the sixth inning, a World Series record for a rookie. The previous record was thirteen (John Stuper, STL, 1982, and Dickie Kerr, CHW, 1919). Reyes' final line was eight-plus innings, four hits, two runs, and four strikeouts. The Cards took advantage of Detroit's mistakes again in the sixth, when Brandon Inge made two errors in one play. With runners on second and third, Inge threw to home wild to score a run and then obstructed Scott Rolen, who was running home, to score another run. Craig Monroe hit a solo home run off Reyes in the bottom of the ninth, which led to Reyes being pulled from the game, as Braden Looper came in to finish the game. The final score was 7–2 Cardinals, marking the first time since 2003 that the National League had won a World Series game, and the first World Series game won by St. Louis since Game 5 of the 1987 World Series. With a starting temperature of 44 °F (7 °C), controversy surrounded the start of Game 2 when Tigers starting pitcher Kenny Rogers was found to have a substance on a patch of the palm of his pitching hand during the first inning. Although Cardinals hitters claimed that the ball was doing "weird things" in the first inning, Cardinals manager Tony LaRussa did not request an inspection of Rogers' hand to determine what the substance was. Rogers claimed it was a combination of dirt and rosin (both legal), but complied with a request from the umpires to wash his hands before the second inning. 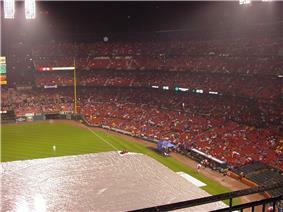 Game 4 was pushed back a day because of rain, the first time a rainout had occurred since Game 1 in 1996. The fans from the game were to attend Game 5. (Thus, fans who had tickets for Game 5 went to Game 4 instead.) The Cardinals won, taking a 3–1 series lead. The Tigers took a 3–0 lead into the top of the third, after Sean Casey had two RBIs, including a home run. The other RBI came from Detroit's Iván Rodríguez, who singled in Carlos Guillén. Rodriguez, who had been hitless in the previous three games, also went 3-for-4. In the bottom of the third, the Cardinals struck back with a run-scoring double by David Eckstein, scoring Aaron Miles who had the first stolen base of the series by either team. Yadier Molina doubled in Scott Rolen in the fourth to cut the Tiger lead to 3–2. The score remained that way, until the bottom of the seventh, when Eckstein led off with a double over the head of Curtis Granderson, who had slipped on the wet Busch Stadium outfield. Eckstein then scored on a sacrifice bunt by So Taguchi that was thrown over the head of Plácido Polanco covering first by Fernando Rodney, and that tied the score at three. Later that same inning, Preston Wilson hit a single to left with two outs that scored Taguchi from third. The Tigers tied the game in the top of the eighth on a Brandon Inge double that scored Iván Rodríguez. In the bottom of the eighth inning, the Cardinals would regain and keep the lead when Miles scored on a double by Eckstein just off the glove of outfielder Craig Monroe, who had been playing shallow and dove for a ball just out of his reach. 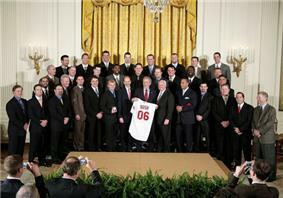 The Cardinals are honored as champions of the World Series by White House on January 15, 2007. On radio, the Series was broadcast nationally by Dan Dickerson and Jim Price called the Series for the Tigers on WXYT-AM in Detroit (with retired, longtime Tiger announcer Ernie Harwell calling an inning of Game 1), while Mike Shannon and John Rooney called it for the Cardinals on KTRS-AM in St. Louis. Per contractual obligation, the non-flagship stations on the teams' radio networks carried the ESPN Radio broadcasts. ^ "2006 World Series". Baseball-Reference. Retrieved January 6, 2014. ^ Lawrence, Andrew (November 8, 2006). "By the Numbers". Sports Illustrated. Retrieved October 15, 2009. ^ "SI.com - Series business - Oct 20, 2006". CNN. October 20, 2006. Retrieved March 26, 2009. ^ "World Series scouting report: Detroit Tigers". USA Today. October 20, 2006. Retrieved April 22, 2010. ^ a b Sheinin, Dave (October 29, 2006). "La Russa Gets Number He Wants". Washington Post. Retrieved April 12, 2007. ^ "2006 World Series Game 1 - St. Louis Cardinals vs. Detroit Tigers". Retrosheet. Retrieved September 13, 2009. ^ "2006 World Series Game 2 - St. Louis Cardinals vs. Detroit Tigers". Retrosheet. Retrieved September 13, 2009. ^ "2006 World Series Game 3 - Detroit Tigers vs. St. Louis Cardinals". Retrosheet. Retrieved September 13, 2009. ^ "2006 World Series Game 4 - Detroit Tigers vs. St. Louis Cardinals". Retrosheet. Retrieved September 13, 2009. ^ "2006 World Series Game 5 - Detroit Tigers vs. St. Louis Cardinals". Retrosheet. Retrieved September 13, 2009. ^ "Boxscore | MLB.com: Postseason". MLB.com. Retrieved July 6, 2008. ^ "Kenny Rogers cheating with pine tar". USSMariners.com. October 23, 2006. Retrieved October 19, 2012.